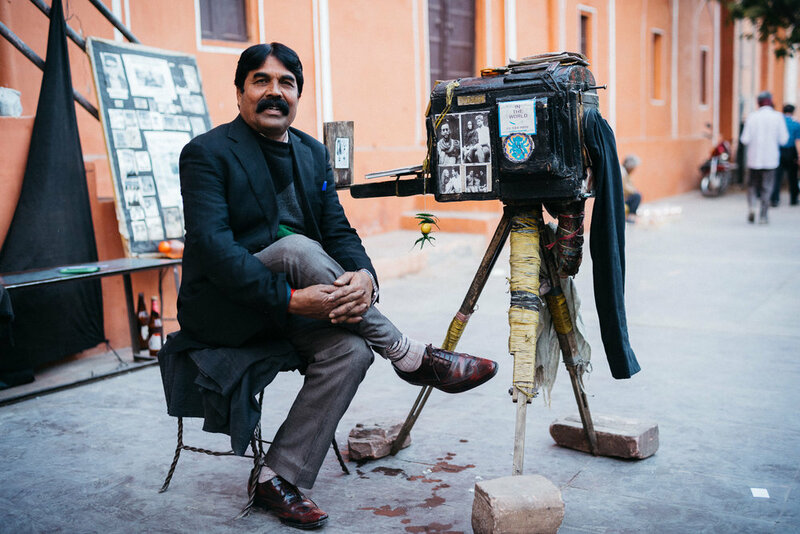 On one of Jaipur’s main streets, near the Hawa Mahal (Palace of the Winds), Teekam Chand is setting up his World War I era box camera to take his next portrait and is directing his subject. Me. Teekam has been photographing passersby for 30 odd years. He learnt how to use the camera from his father and his father from his grandfather. Sat in front of a black screen, he focuses the Zeiss lens and sets the camera up. He lifts the lens cap off, counts to 4, places it back on the lens and the photograph is taken. Over the next ten minutes Teekam busies himself in the back of the box camera developing the film. First comes the negative and then the finished print emerges. Magic. From the amount Teekam charges, I can tell this is a labour of love. His children aren’t interested in taking on the business. So get your portrait while you can.